WordPress WooCommerce Wallet System is an awesome plugin which allows customers to make the online payment from their Wallet. In this plugin, the admin can manually debit or credit amount into the customer’s wallet. You can offer your customers a new convenient way of paying for goods and services. The wallet is an online prepaid account where one can stock money, to be used when required. There is no chance of a decline in payment since wallet is a prepaid account. As it is a pre-loaded facility, customers can buy a range of products without having to enter their debit/credit card details for every online transaction. In this plugin, customer/user can use Wallet Cash during the checkout and amount will be deducted from their Wallet Cash. They can easily add credit to their wallet. 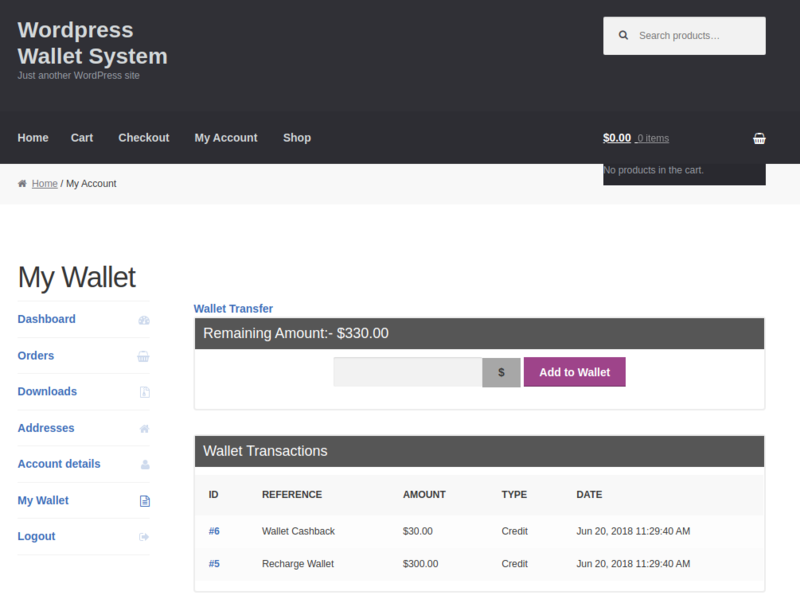 WordPress WooCommerce Wallet System Plugin behaves as an online Payment Gateway. It behaves as an online payment gateway so a buyer can purchase products from the store by using its available amount. The customer can easily add credit to their wallet. The process of adding credit to their wallet system is super easy for the customers of an online store. They simply need to enter the amount that they want to credit to their wallet system and checkout via available payment methods. 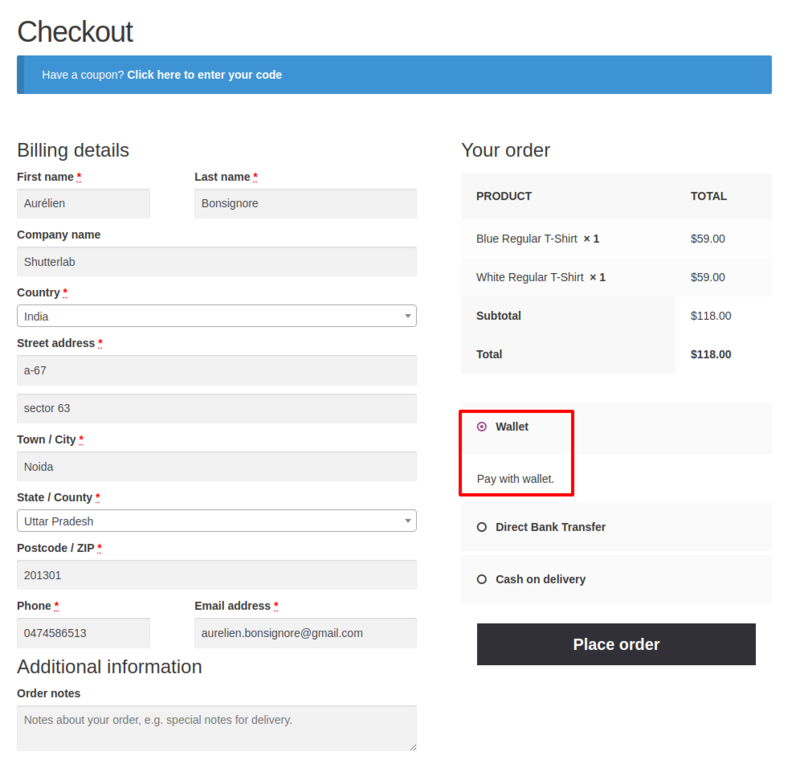 On the checkout page, a customer can choose to use wallet cash or any other payment method. While placing an order, a buyer can choose whether he wants to use wallet cash for checkout or not. Wallet amount will get credited after the approval of admin. If a buyer uses a payment method like Direct Bank Transfer, Check Payments, then the amount will be credited after the approval of admin. Mail notification for wallet transactions. A Customer will be notified via e-mail of all the wallet transactions. The admin can view the transactions made by the customers and also the transaction details like transaction id, reference, transaction type, amount, date etc. The admin can manually Debit or Credit amount into the customer’s wallet. The admin can set minimum cart total, maximum cart total and the cashback amount which the customer will receive if the cart total lies in the range selected by admin. Minimum Wallet Credit Amount can be set by admin which means a customer has to credit at least this much amount in his/her wallet. The admin can also set maximum wallet debit amount which means that the customer can use at most this much amount in a single transaction. If the admin has selected the multiple cashback conditions then the customer will get cashback applicable to both cart and product. If the admin does not choose multiple cashback conditions then the customer will get cashback applicable to cart or product, the preference of cart or product will also be selected by admin. A customer can transfer his cashback amount to any registered customer. You will get a zip file after purchase. Upload it in the “Add New” menu option in the WordPress Admin Panel. For this login to WordPress Admin Panel and Under the Dashboard hover your mouse over the “Plugins” menu option which brings out a Sub-Menu and then select the “Add New” option. Now when the plugin is installed correctly, you will see the success message and an option to activate the plugin. Click on “Activate Plugin” to activate the installed plugin. After successful installation of WordPress WooCommerce Wallet System Plugin, admin can configure this under “WooCommerce > Settings > Checkout > Wallet”. Now it acts as a payment method. Enable this to use at checkout time. Admin can also change the order of Wallet System in the list of payment methods under “WooCommerce > Settings > Checkout > Gateway Display Order”. After login, “My Wallet” tab available on the customer’s My Account page. From here a customer can easily manage his wallet. By clicking on “My Wallet”, the customer can see their total Wallet Balance, Wallet transaction details. The customer can also add credit amount into their Wallet System by entering the amount into the provided input box. Please refer the below image for the better understanding. Now customer enters his desired amount which he wants to credit in wallet system and clicks on “Add to Wallet”, it will be directed to the checkout page where they can see Wallet Amount. A customer can see summary for recharging their Wallet and pay the amount. After making the payment, the customer can see the credited amount in their wallet as per the below image. 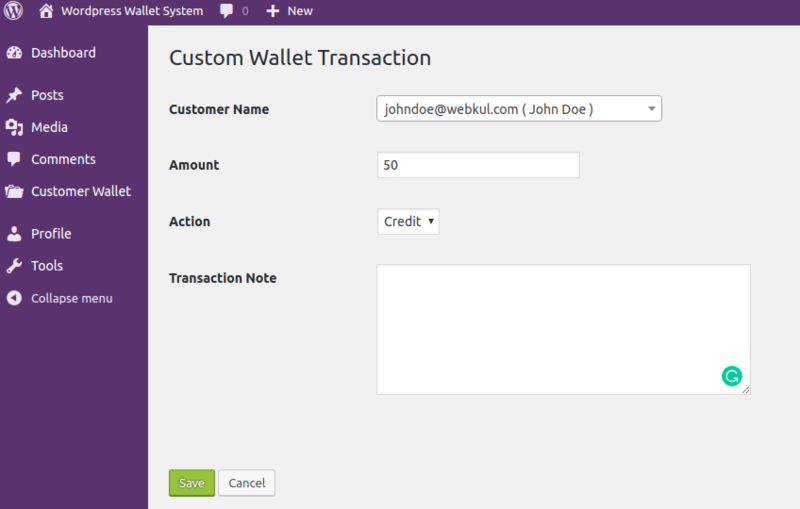 The transactions are visible to the customer under “Wallet Transactions”. The customer can view the wallet transaction details under “Wallet Transaction” by clicking on the “ID” of the transaction made by the customer. A customer can use wallet amount at checkout time. Have a look at the use of wallet amount at checkout time in different situations. If there is no wallet cash available then “Pay via Wallet” or “Wallet” are not available at checkout time. Buyer needs to pay for the order via other payment methods. In this situation, a “Pay via Wallet” option available at the checkout time. Here buyer can choose “Pay via Wallet” to pay via wallet and rest of amount via other payment method or he can pay total amount via other payment methods. The amount will be deducted as per the below screenshot if a customer chooses “Pay via Wallet”. Here a buyer can choose “Wallet” to pay via wallet. A customer can see the order details after placing order successfully. Once order gets processed the amount will be deducted from the wallet. A customer can transfer his wallet amount to any other registered customer by clicking on Wallet Transfer option in My Wallet Tab. After clicking on Wallet Transfer option, a customer has to enter the registered customer name and the amount he wants to transfer and then click on Transfer. Once the customer clicks on Transfer option he will receive an OTP, after entering OTP and clicking on Verify option, Amount Transferred Successfully message will be displayed. After the customer has transferred the amount, he can see the remaining amount. 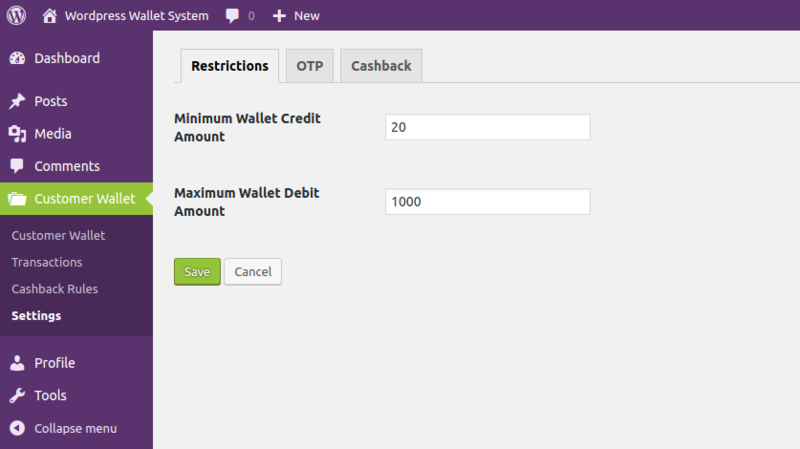 Admin can manage the wallet system and orders under “Customer Wallet”. Here admin can see the wallet balances of customers. After approval of the order by admin from WooCommerce Orders, the amount will be deducted from the wallet cash. The admin can also set the refund amount for the orders in which the payment has been done through the wallet. For this admin has to navigate through WooCommerce->Orders and then click on the view option. On clicking Refund option, the admin can enter the Refund amount and click on Refund via Wallet. Under “Customer Wallet > Manual Wallet Transaction” the admin can debit or credit wallet amount manually as well. Here select the customer from the drop-down and enter the amount. After that select the action as per the requirement whether “Debit” or “Credit”. And finally, save. The admin can also set cashback rules for the customers as per his requirement by navigating through Customer Wallet->Cashback Rules. First of all the admin has to set cashback type as fixed or percentage. Then the admin can set minimum and maximum cart amount for the customers to avail cashback. The admin can also set the cashback amount. The admin can also apply cashback for a particular product. The admin can set some restrictions on the wallet usage by customers. The admin can set minimum wallet credit amount which means that the customer has to credit at least this much amount in his/her wallet. The admin can also set maximum wallet debit amount which means that the customer can use at most this much amount in a single transaction. The admin can also enable or disable the OTP verification for the customers. 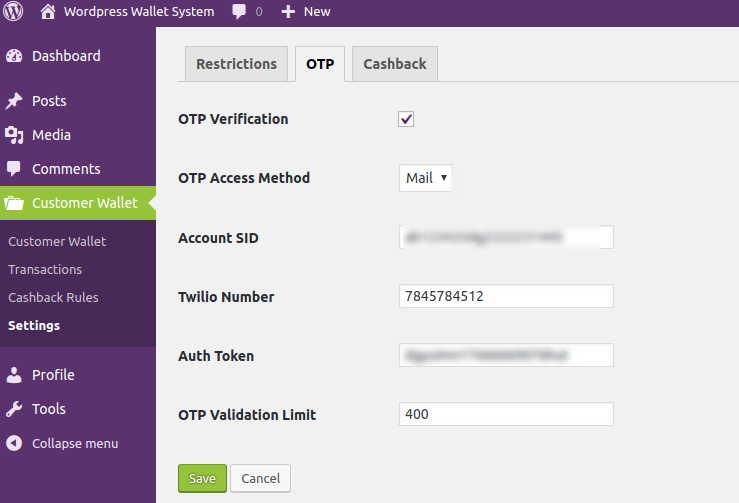 The admin can also select the OTP Access Method as Mail or SMS, by which the customer will receive OTP. OTP Validation Limit can also be set by admin which means that the time limit allowed to the customer for applying the OTP. This OTP verification will be valid for a wallet to wallet transactions. Note: If the Admin selects SMS as the Access Method, then he has to install Twilio package via composer. The way to install Twilio via composer is:- composer require Twilio/sdk. 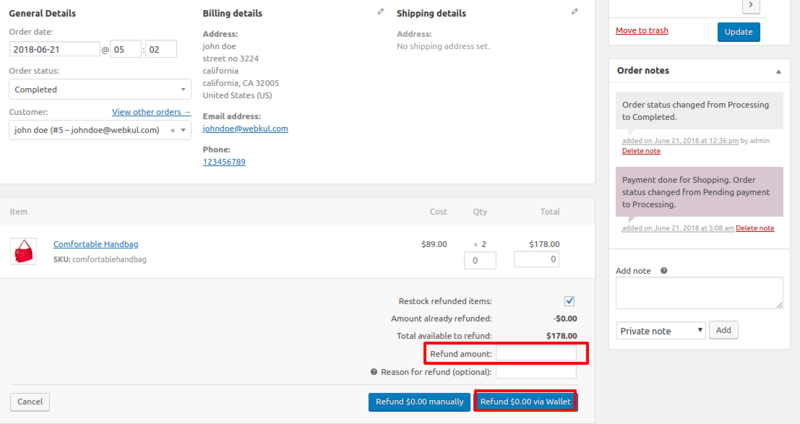 The admin can apply cashback on the cart as well as the product. Multiple Cashback Conditions: If the admin has set Multiple Cashback Conditions as no then, in this case, the customer will be able to avail cashback applied to product or cart. If Admin has set Multiple Cashback Conditions as Yes then the Customer can avail the cash back applied to both product as well as the cart. Preference in Multiple Cashback– The admin can set a preference for the cashback to be availed by the customer. If the admin has set Multiple Cashback Conditions as no and the preference as Cart, then the customer will be able to avail the cashback which is applicable to cart and if the preference has been set as a product, then the customer can avail the cashback which has been applied to a product. Does this E-Wallet support the online sales of legal CBD oil? Yes, the wallet supports the purchase of any type of product added in the cart to make the payment for the order via the wallet. If you have further queries then you can contact us at support@webkul.com. Great information Glad to find your article. Will love to follow you from now. Hi Jennifer, thanks for the appreciation. Is it possible to allow for a negative wallet balance? Basically, it is a company store where we just need to track the amount spent so we can subtract from their paycheck. So, we want them to be able to spend into the negatives. The feature you are asking for is currently not available in our module. But you can achieve it by customization for this feature which is a paid service. For further information regarding customization, you can connect with us at support@webkul.com. Is it possible to make some product can purchase by only credit ? Is it possible to limit the Maximum amount in percent used by the customer during the checkout time based on total cart value (ex: If total cart value is 5000 then user can use upto 500 (i.e. 10%) only) ? . As per my knowledge currently we can only set a fixed amount for maximum debit, which is completly unreleted to total cart value. Thanks in advance. The requirements can be done via customization. Please contact us at sales@webkul.com for more information. Hi, great plugin ! is it possible to limit the amount used by the customer during the checkout time (ex: maximum of 19€ per order) ? Thanks in advance.